Choose our incandescent 120V rope lights to illuminate your residence or business for a dazzling holiday display or for year-round use. 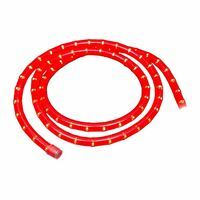 Because rope light is made of a highly durable PVC tubing, it is suitable for both indoor and outdoor use. Spaced 1" apart throughout its length are .46 watt miniature bulbs for a total of 5.5 watts per foot and a 25,000-hour bulb life. Because these mini bulbs are vertically embedded, our rope light has a wider angle of illumination than many of our competitors. Light up your exterior by outlining windows, doorways, decks & porches, rooftops, driveways, signage and more. Interior applications include under- or above-cabinet lighting, lighting up a toe kick, and more. 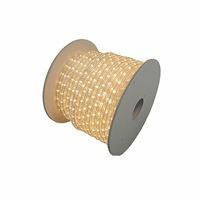 Choose your colors and let our rope light experts help you decide if you need our 150-foot spool or a custom rope lighting kit. We have helped thousands of customers with a wide variety of lighting projects and are ready to help you.